Fill a soup pot 2/3 full with water. Bring water to boil. Add macaroni to boiling water and continue boiling for 4 minutes. Add chopped cauliflower to pot and boil macaroni and cauliflower for an additional 5 minutes (cauliflower should be very tender). Drain macaroni and cauliflower in strainer. Add Alfredo sauce, cheese and broth to the empty pot and over medium heat stir sauce until cheese melts and sauce is hot. 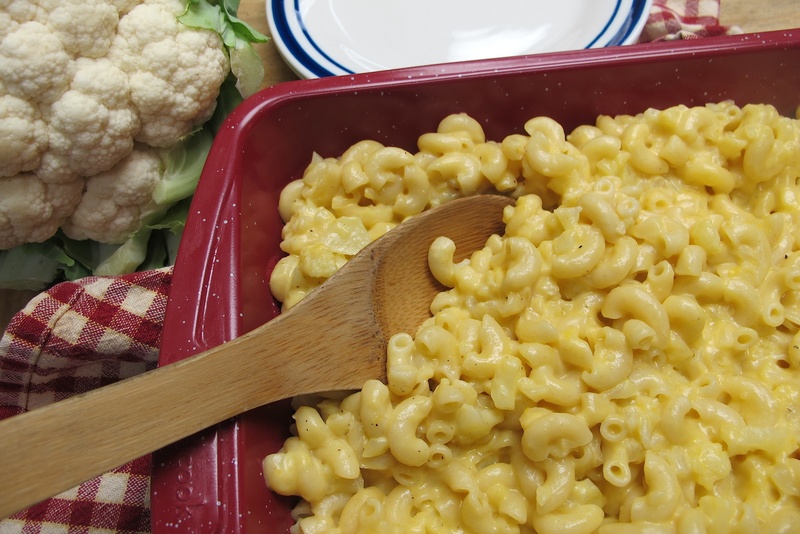 Remove pot from heat and add cooked-drained macaroni and cauliflower to sauce. Gently fold sauce into macaroni/cauliflower with large spoon. Add salt and pepper to taste and a dash of ground nutmeg (optional). Enjoy and serve often to a hungry family!